Just when you think you've seen it all in pro wrestling, something like this comes along. 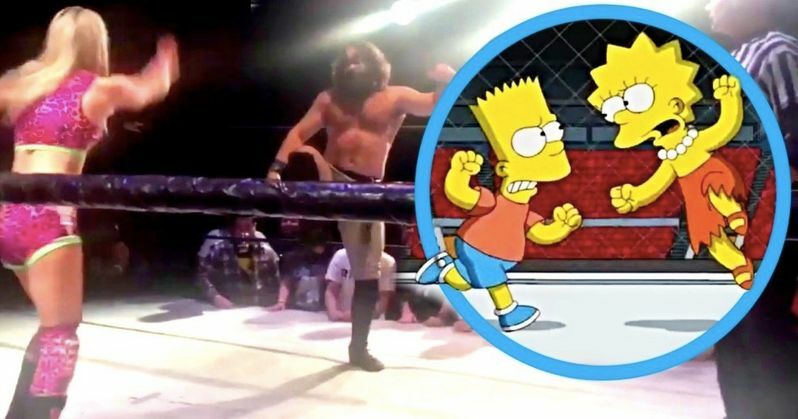 At a recent wrestling show put on by Bar Wrestling in Los Angeles, an iconic brawl between Bart and Lisa on The Simpsons was actually recreated in the ring by pro wrestlers. The moment came during a tag team match between Killer Baes (Laura James and Heather Monroe) and RockNES Monsters (BHK and YUMA). At one point in the match, James and BHK are squaring off in the ring, when James begins twirling her arms in the air in a windmill-like fashion. Knowing the reference already, fans start chanting for BHK to start kicking the air, which he does. Like Bart and Lisa, the two converge on each other this way, before their tag team partners come in and break up the action. Every fan of classic Simpsons will instantly recognize this fight between Bart and Lisa on the season 6 episode, "Lisa On Ice." The episode pits the Simpson siblings against each other when the two play on competing hockey teams. Their bickering leads to a moment when Lisa demands Bart leave her bedroom. Bart begins twirling his arms like windmills, telling her if Lisa gets hit, it will be her own fault. In response, Lisa starts kicking the air in front of her, telling her brother that if any part of him "should fill that air," getting kicked will be his own fault as well. The bizarre fight scene has since been quoted endlessly by big fans of the show in the years since, and now we know how it would play out in the midst of a wrestling match. Indie shows like this one from Bar Wrestling are proving to be where modern pro wrestling is most entertaining. WWE is not without its outlandish storylines, but it's doubtful they'd ever allow their performers to act out classic Simpsons moments in the ring. Another recent video from the indie wrestling circuit to go viral shows a Michael Jackson impersonator as a wrestler, mixing dance moves with pro wrestling maneuvers. You never know quite what you're going to see at a wrestling show, and that especially seems to be true when it comes to independent promotions. Starting its run in 1989, The Simpsons is now in its thirtieth season. The series holds several world records and shows no signs of slowing down anytime soon, with plans to continue producing new episodes for season 31. Although the series remains popular, the episodes from its first decade are still considered by fans to be the "Golden Era." The "Lisa On Ice" episode is particularly well-remembered as it came right in the midst of this time with a plethora of quotable lines and memorable moments. We'll see what comes next from the wrestling world soon enough. Recreating more classic moments from The Simpsons would certainly be welcome. Perhaps one day we'll see someone carrying a wrestler away from a stronger opponent with a paramotor, the way Moe did with Homer in the episode, "The Homer They Fall." This information comes to us from pro wrestler Joey Ryan's YouTube account, and you can watch the footage from the match in the video below.